​Do enjoy solving and working your way through problems? Are you an analytical thinker who likes to create, design, and build? If you answered yes to any of these, then the Engineering and Robotics program might be the right fit for you. In this project-based class, students learn the ins and outs of engineering and design and robotics. Students will learn hands-on utilizing the latest in technology from the program's computer aided drafting software on down to its 3D printer. Students will participate in the national technical organization SkillsUSA. Students in the Engineering and Robotics program may earn dual credits while in high school. (Dual credit allows the student to remain at SWCA, take college level courses, and earn both high school and college credits!) Engineering and Robotics students who meet the criteria may purchase up to 12 semester hours of college credits through Sinclair Community College. These transcripted credits are transferable to many area universities, including The Ohio State University. 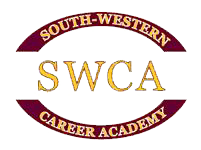 In many cases, the “Project Lead the Way” coursework taken at the South-Western Career Academy replaces introductory engineering courses (at a fraction of the cost) in majors such as Computer, Electrical, or Mechanical Engineering. Check out our Engineering and Robotics students in action working on their projects and designs below! Check out the videos below of the students and their engineering projects!